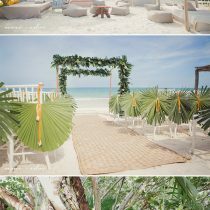 Who said that a military beach wedding had to be quick and boring? Anna Kim dispels that myth immediately with these endearing captures of a couple who are oh so in love. Their story is a lovely one, as the bride fell head-over-heels for not only her husband, but also Hawaii itself; for it was in Hawaii where he surprised her with a super cute proposal! 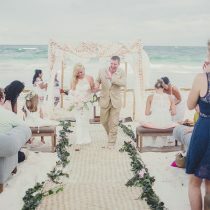 With a wedding dress embellished with amazing floral lace detail, the décor of the wedding was, as the bride puts it, “relaxed, intimate and classy” with very soft colors. The Ritz Carlton Maui was the perfect venue for this military beach wedding, as well as beautiful landscapes further towards the shore. A blissful wedding and a possible honeymoon location to occur afterwards? Definitely a pleasant convenience in my book! Wow! Thank you so much for featuring this wedding! It was such a beautiful day! I love your blog–keep up the great work! Thanks Anna! Looking forward to see more of your stunning photos!